“A new white paper presented to the House Permanent Select Committee on Intelligence carves out an ‘evolving mission’ for Homeland Security that moves away from fighting terrorism and towards growing a vast domestic intelligence apparatus that would expand integration with local/state agencies and private-public partnerships already underway via regional fusion centers. 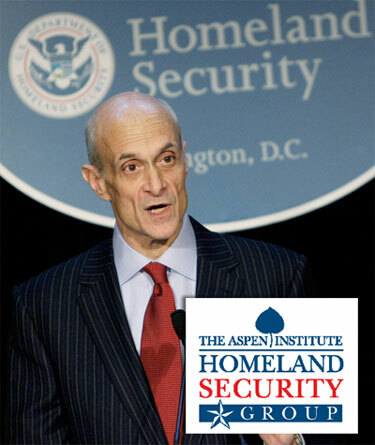 “Crafted by the Aspen Institute Homeland Security Group, co-chaired by former DHS chief Michael Chertoff and composed of a who’s who of national security figures, the report outlines a total mission creep, as the title “Homeland Security and Intelligence: Next Steps in Evolving the Mission” implies. The web of 9/11 perpetrators, drug runners, money launderers, counterfeiters, job exporters, wall street fraudsters, mkultra child abusers etc who reign with impunity is bloating like any other self-interested bureaucracy or corporate conglomerate. This is what runaway corruption looks like. It has all the banality and hypocrisy of a philandering evangelical huckster. But there is no one overlord or one unified criminal organization. It’s more of an echo chamber, an elitist social movement, a shared belief of how the world ought to be and their rightful place in it. An emergent, collectively autocatalytic network of mutual backscratchers jockeying for their place in a new american aristocracy. And they intend to make it happen. Why? Because they think they can. Previous PostMMR & Autism: New Evidence Refutes Fraud Findings in Wakefield CaseNext PostWhy All the Robo-Signing? Fake Food: Don’t Mess with Mama! Keiser: Clowns Run the World!